One of the more difficult aspects of modern music is a distinct lack of availability of scores for study purposes. While it is a very straightforward process to obtain a score for just about anything that Beethoven or Mozart might have written, it is far more difficult to obtain a score for most of the film music written in the last thirty years. The development of advanced notation software has not only made composing and orchestrating more efficient, but makes sharing the end result easier. 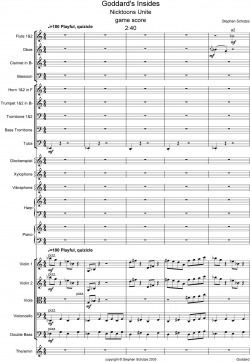 All works included on this page were composed and orchestrated using Sibelius.